2 Panels Blackout Curtains Just $9.90! Down From $100! You are here: Home / Great Deals / Amazon Deals / 2 Panels Blackout Curtains Just $9.90! Down From $100! Don’t miss this amazing deal from Amazon! Get this TEKAMON 2 Panels Blackout Curtains in Aqua Green for just $9.90, down from $99.90, PLUS FREE shipping for Amazon Prime or orders $25 or more! Want to enjoy a good nap or save energy cost in spite of the harsh sunlight? 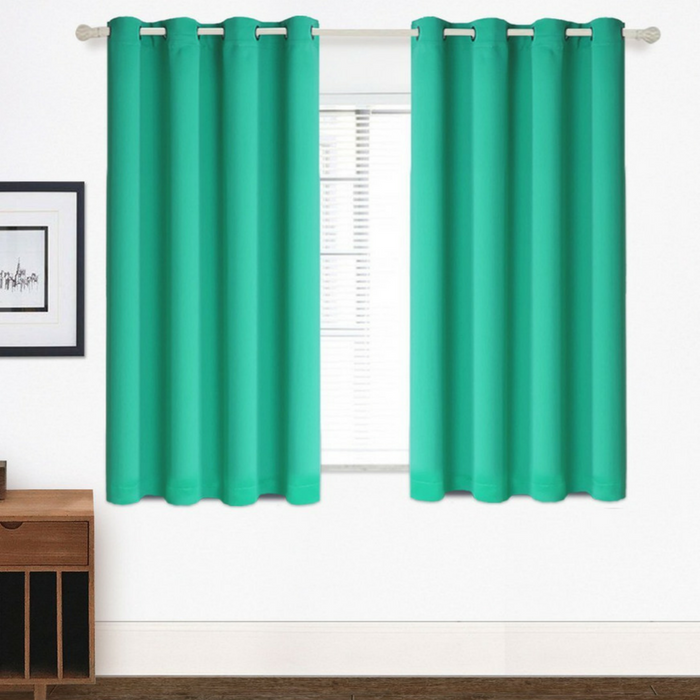 TEKAMON 2 Panels Blackout Curtains in Aqua Green is the perfect solution for you! They encourage the best sleep quality and offer the most comfortable circumstance for day sleepers and those who have trouble falling asleep, by automatically darkening and lowering noise levels. The heavy microfiber blackout curtains are interwoven by top fabric layer, high-density black yarn, and back fabric layer with advanced triple weave technology. They will pay for themselves off over time since they are energy saving through balancing room temperature by helping to prevent summer heat and winter chill from invading through the window. They can also protect your furniture, floors, and artwork from the ravages of the sun! Distinctive Material: SOFT and SILKY fabric, natural, vinyl free, environment-friendly, pleasant to touch and leave no wrinkle after wash. Exquisite hemming, more durable than usual curtains so no worrying for loose threads. Enhanced Blackout Capacity: These blackout curtains perform well at blackout as it adopts TRIPLE WOVEN and ultraviolet semi-fiber technology. It can block out 85%-99% sunlight, protect your furniture, floors, and artwork from the ravages of the sun against UV rays, as well as reduce 10-20 FB noise off. The thermal insulated design saves your energy cost by balancing room temperature against summer heat and winter chill. Classic Elegant Design: Each panel has 8 elegant rust-free metal grommets(1.6-inch inner diameter), which fit well with standard or decorative curtain rods and cause no noise during sliding. It is suitable for any types of decoration and makes your home chic and classic. Machine washable in cold water and tumble dry, making your life easier and more convenient.